THIS weekend has had a bit of an odd feeling about it, like we’ve known it’s the last of its kind. A bit like the end of term or leaving a job – you know there’s a change coming, and you want to cling on to the present for just a little bit longer. We hadn’t really even known if we’d have the weekend together, or if we’d be spending it split between home and the hospital. But there was no baby, so we had our last weekend as a three – and we crammed a lot into it! We’d gone shopping for Santi’s birthday presents a week or so ago, planning to buy a picnic table with sand and water trays for the patio … but when we were in the shop we kind of fell in love with a wooden playhouse and after a bit of deliberation we decided to go for it and order it, even though a picnic table that requires no painting and minimal building would have been the much easier option! I’m not sure when we were planning on getting all this done, as the house wasn’t due to arrive until today, and Stew is in work for the rest of the week. Luckily, on Friday morning Santi spotted a lorry outside, and to his huge excitement it was the Toys R Us delivery man! Oh how a man with a box on a trolley can brighten up a toddler’s day. There were no questions about what was in the box, just many stories about the man with gloves who brought it in, and that gramps would cut it open (it seems Santi has quickly learned not to trust Stew with any form of DIY). 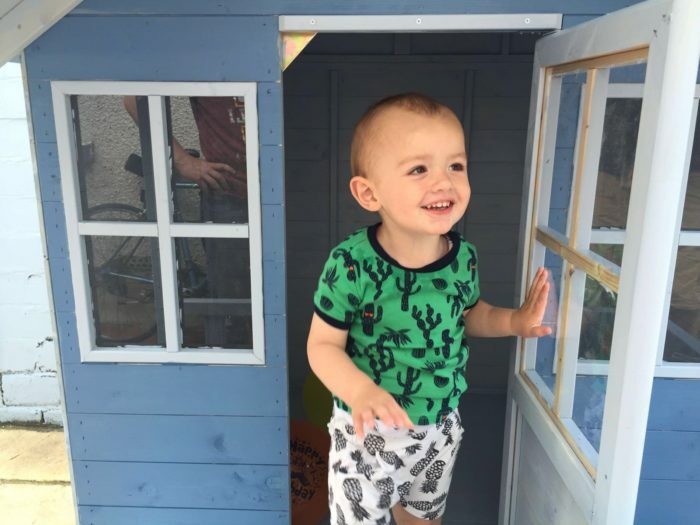 Every spare minute of the weekend was spent painting the house (once we’d agreed on a colour), and my parents took Santi out of the way on Saturday so we could get on with it … I’m grateful they did because we discovered on Sunday morning that Stew, Santi and paint do not mix well! It’s a good thing we had a birthday party on Sunday afternoon to get us all out of the house and away from playhouse-gate! If you’d asked me a few weeks (or even days) ago if we’d have made it to the party I’d have said definitely not … I was so convinced baby would be here by now! 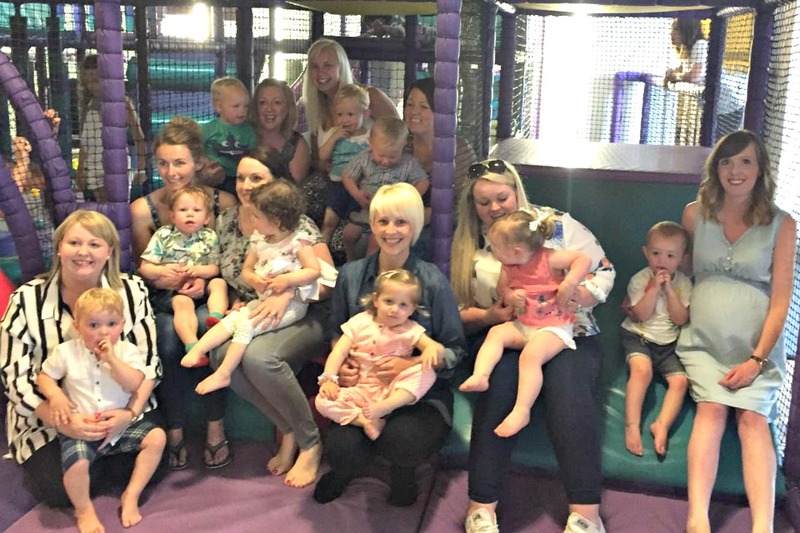 But no, me and the giant bump were there, and Stew came along to help me out as there’s no way I could chase Santi around a soft play place … it would end up like that episode of The Simpsons where Homer gets stuck in a slide, with toddler piling up behind me. As hot and uncomfortable as it was, it was lovely to see the baby group for a catch up as I wasn’t sure when I’d manage it next. Not the best quality, but soft play isn’t ideal for photos! We had a visit from Stew’s father and his partner when we got home, then Stew went to the cinema with his brother so it was a bit of a manic day in the end! In a guilt-ridden panic that I might be in hospital on Santi’s birthday I’d suggested to Stew that maybe we should have a small tea party at home on Monday while we were both around … come Monday morning that didn’t seem like such a good idea when we still had the playhouse to build (it was like an ongoing saga over the weekend) and 12 guests to prepare for. I kind of forget a small gathering isn’t really possible when you have a family the size of Stew’s! A couple of the girls were taking their little ones to the wetland centre in the morning, so at the last minute I decided to take Santi out for a walk with them while my father and Stew put the house together. 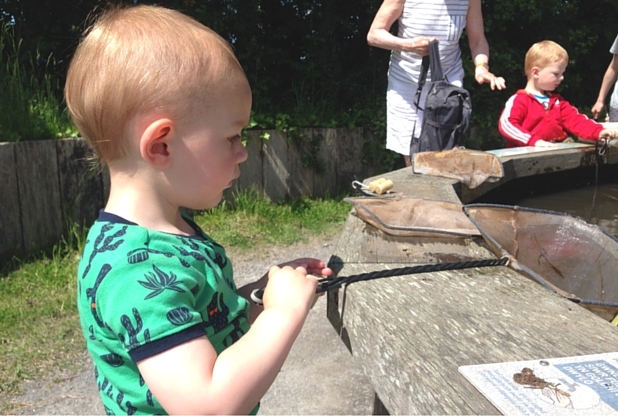 It was really chilled and lovely to get out for a couple of hours … and even though he’d been a bit of a menace in the house, Santi was really well-behaved (we’ve had a few laying on the floor tantrums recently, so there’s always the risk of an outing ending badly!). It’s fascinating to see the toddlers interact with each other. Santi started off quite shy and reserved, but by the time we got to the flamingo enclosure he was shouting away and bossing the other two around. Cheeky monkey. We almost had an About A Boy-style dead duck day incident on the way back to the visitor centre, which was ever-so-slightly embarrassing. Overly excited about the thought of fishing for bugs, Santi kind of slung the stick he’d found into a pond and very narrowly missed a pair of mallards. Oops! 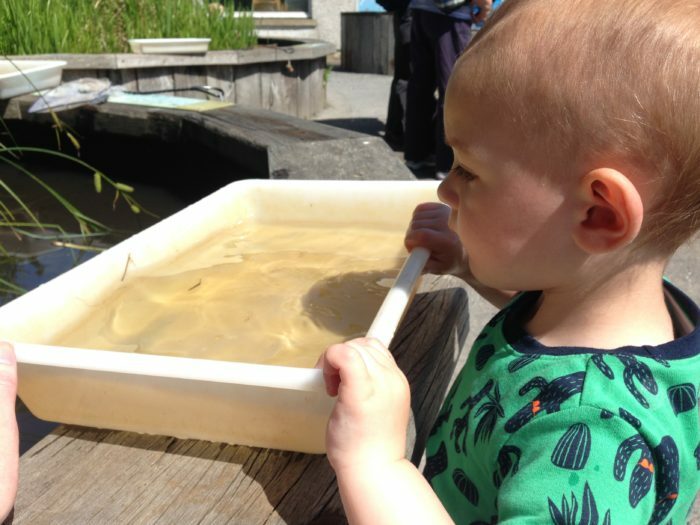 Pond dipping was undoubtedly the highlight of the visit for Santi – even above the Joe’s ice cream tub – prodding around in muddy water with a stick and finding bugs, what more could he want? And getting ready to tip it all back out again when he realised I was a bit rubbish at it! 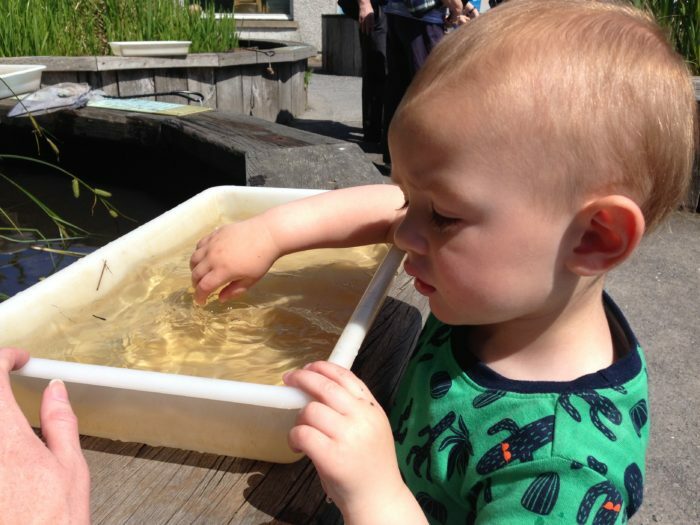 I actually quite enjoyed it too … until someone else’s child tipped a tray of cold pond water over my back. I admit a pale denim dress isn’t the most appropriate of pond dipping attire, but when you have one dress and one pair of jeans that fit there’s not much wardrobe choice going on! By some fluke there was no stain and I didn’t have to resort to wearing pjs for Santi’s party. When we got home the blasted playhouse STILL wasn’t built, so there were more distraction tactics to keep Santi away from it as we really wanted it to be a surprise. Thankfully, my mother had been shopping for party food (I have no idea how I’d have fitted that in too), so she kept Santi entertained while I made a start on the sandwiches. Just a heads up to anyone else who might be heavily pregnant and coming up with what you think are nice plans … you will question why on earth you suggested throwing a party while making a million sandwiches on the hottest day of the year. 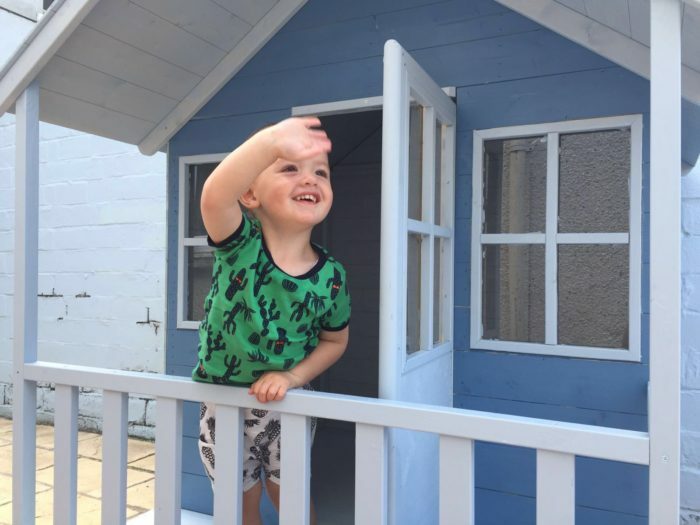 Luckily, the big playhouse reveal turned my mood around … you’d swear we bought Santi a mansion, not a wooden house, the way I’ve built this up. We brought him out to the yard to show him the finished house and his reaction couldn’t have been sweeter. At first he seemed really tentative as if he didn’t know if he could go inside, but as soon as he did he was beaming. He was waving from the balcony as if it was his castle, and totally unprompted said “thank you” in the loveliest little voice. All of a sudden I couldn’t care less if there were enough sausage rolls on the table, our little man was happy and that was all that mattered. 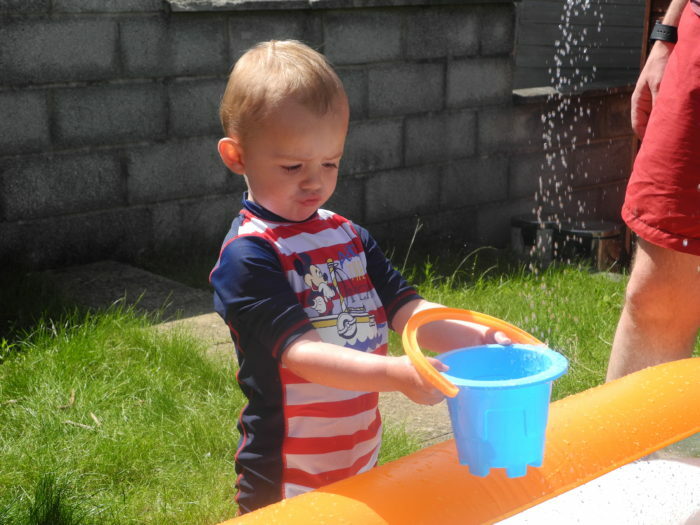 The rest of the afternoon was spent eating and chatting, while Santi and his two older cousins played in the paddling pool. After rushing around for most of the weekend, it was nice to sit out the garden for a few hours in the sun. 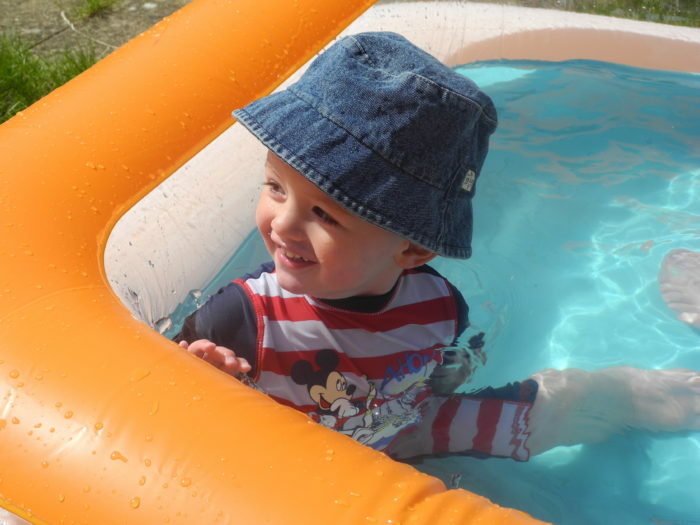 Santi had an absolute ball (even if his little chin was wobbling in the cold water) – he was in and out of the pool and his house, and loved it when we all sang happy birthday (he’s been waiting for that for days!). After all the excitement we had one tired toddler on our hands, but it was worth it to know he’d enjoyed so much. 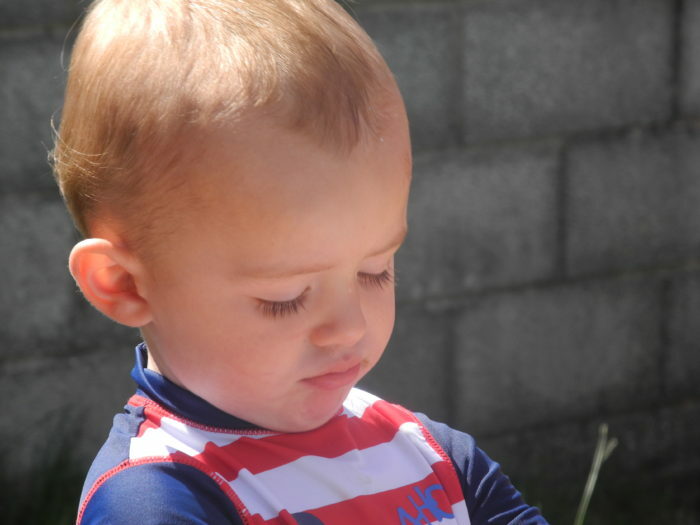 I can stop feeling guilty that his birthday might be overshadowed by the arrival of his sibling (I’m keeping everything crossed that they don’t share a birthday) and the mammoth job of the playhouse can be ticked off! I was convinced after such a jam-packed three days that baby number two would make an appearance last night, but nope, he or she is sitting tight and keeping us waiting! ← Packing for labour: What’s in my hospital bag? I did regret having such a busy weekend on Tuesday when I couldn’t even face leaving the house! At least it gave me a chance to wash the one dress that still fits!